Demo unit - great savings! 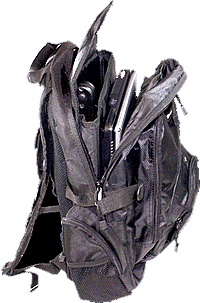 Image showing the padded rucksack that comes with the Readit Scholar, capable of transporting the Readit Scholar, a 15.4 inch laptop, accessories and books. Fast Set Up time: Readit Scholar has been specifically designed to be as fast to set up and take down as possible - it takes less than 15 seconds. Just unfold it, plug in one USB connector and you're ready! Readit Scholar's Features - Readit Scholar has many advanced features to help you read faster and with less effort than ever before. Enhanced views for reading Together with the high contrast two colour reading mode, Readit Scholar features 4 other ways to read. Designed for looking at handwriting or simply looking at items in full colour or enhanced two colour mode. This unique mode allows you to retain your document layout and full colour images whilst fully enhancing the text. You can simply click on a word to start Readit reading your document to you from that point. This view stretches all of your document's text into a single line meaning you can just set the speed of scolling and reading, sit back, and read your document. This view centres one word on each line so you can just set the speed of scolling and reading, sit back, and read your document. This view fits as many words as it can onto each line and then lets you scroll and read them vertically. Simply lift the Readit Scholar from its carry case, plug one USB 2.0 cable into your laptop or desktop computer and within seconds see the document you've placed under the camera read out aloud to you with scrolling text in your desired colour combination and size. The Readit family are the only systems capable of capturing such large documents. For the first time, a standard size tabloid newspaper page can be captured in its entirety. Readit Scholar features a high quality live view with up to 40x zoom which can be used for magnifying local or distance objects. 16 enchanced two colour combinations as well as full colour viewing are selectable, together with contrast enhancement for viewing even very faint documents such as receipts. Capture 20 pages per minute and begin reading as soon as the first has finished processing. This is many times faster than using a scanner based reading system. Once a document has been captured with Readit Scholar, you can quickly and easily export it directly into Microsoft Word (or your preferred text-editor). The document is fully editable and preserves all the formatting, layout and images. This is ideal for making a large print copy of the document whilst preserving formatting. Alternatively, you can simply export the text with only line breaks preserved. This is ideal for making a text-only large print version. Documents inside plastic folder wallets, glossy magazines and even crumpled pages are recognised accurately thanks to the powerful Readit software. Readit Scholar is available in most European languages. Please contact us for details. Thanks to its advanced software, Readit Scholar automatically straightens the spines of books for you - something which scanner based reading machines struggle with. It can also read labels on tins of food and even some prescription medicine bottles. Comfortable over ear headphones with in line volume control. Back Pack specifically chosen for carrying the Readit Scholar, up to a 15.4" screen laptop, other accessories and documents. Although Readit Scholar will function on any computer system 3 years old or newer, below is information on the minimum and recommended computer requirements. NOTE - Regarding Apple support, Readit Scholar will work without any problems on an Intel processor Mac a virtual machine like VMWare or Virtualbox. It won't run natively on Mac. Please note: laptop not included - Picture shows USB Keypad - not required/included. *NOTE: Unfortunetly Sales is final at this great price.